Above: The Mamba, a light-weight, automated side loading garbage truck, grabs a can from the street. The new Mamba is one of the smallest automated trucks in the industry. SCRANTON, IOWA – The Mamba, manufactured by New Way®, a leader in the waste industry, now features an automated arm for even more efficient garbage collection. The Mamba, one of the smallest automated trucks in the world, also offers customers cart-tipper and barrel-dumper options. New Way® engineers, Scranton, Iowa, automated the Mamba with the proven Perkins arm, manufactured in Illinois. "It will save customers money, it's a good match to the body, and it works great," said Phil Allen, executive VP of sales and marketing. The speedy Mamba, with a 6- to 12-cubic-yard body size, is designed for tight areas too small for a larger packer, such as residential areas with weight limits, parks and narrow alleys. 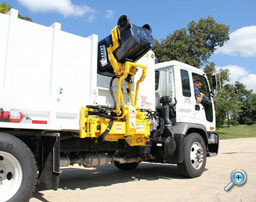 "We felt there was a need for a small automated side loader," Allen said, "and if customers want it, why not offer it?"